We have some great news for SUV lovers: Toyota has produced a hybrid version of its ever-popular RAV4 compact SUV. This may surprise and delight many of you, but some folks have been waiting for a RAV4 Hybrid for more than a decade. The 2016 RAV4 Hybrid may be the first hybrid vehicle to crank out more horsepower and torque than its non-hybrid version - 194 hp in the RAV4 Hybrid compared to 176 hp in the conventional RAV4. But don't tell anybody, or else everyone will want a new RAV4 Hybrid, and there are a limited number available. Now that the 2016 RAV4 Hybrid is finally here, it turns out to be more spectacular than anyone imagined, and we have a nice selection of them in our showroom at 1 Superior Crescent Charlottetown, PO BOX 730, PE. We are anxious to show the powerful and agile 2016 Toyota RAV4 Hybrid to all our friends in Charlottetown, Stratford, Mt. Herbert, Cornwall, Marshfield, Brackley, and Milton Station, so stop by for an invigorating test drive soon. The newest edition to Toyota's world-famous family of hybrid vehicles is also the best. 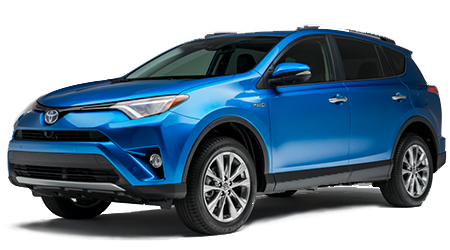 When you step up to the fabulous 2016 RAV4 Hybrid, you also get style, style and more style! This is the launch year of the RAV4 Hybrid, and Toyota is pulling out all the stops. We are not talking about minor cosmetic tweaks to please the critics. There are fundamental design improvements this year that make the RAV4 Hybrid a stand-out on the highway and on your driveway. The front bumper and grill have been completely redone with dramatic recessed fog-lights, and the hood is more chiseled and athletic. From the rear, you see even more style, with contoured taillights and a lowered bumper with silver trim. Speaking of lights, every single exterior light on the 2016 RAV4 Hybrid, from the jewel-like headlights to the futuristic running lights and distinctive tail lamps, is illuminated by LED lights for an attention-grabbing appearance day or night. Toyota did not invent hybrid vehicle technology. Cars powered by a combination of an electric motor and a gasoline engine were first invented at the turn of the century. Not this century, but the last century. In 1899, a man named Henri Pieper developed the world's first gas-electric hybrid automobile, but it was not until the advent of regenerative braking in 1975 that the technology could start competing with internal combustion engines. What Toyota did to advance hybrid technology and make it acceptable to finicky consumers is invaluable, and can never be underestimated. Thanks to Toyota's around-the-clock hybrid research and development, and its building eco-sensitive vehicles that people actually want to drive, hybrid cars, wagons and SUVs are now part of the American landscape. Other carmakers can thank their lucky stars that Toyota paved the way to hybrid heaven. Back to the beautiful RAV4 Hybrid for 2016: a 2.5L four-cylinder Atkinson-cycle engine is connected to a highly-efficient electric motor via Toyota's amazing Hybrid Synergy Drive. The RAV4 Hybrid comes standard with an Electronic On-Demand All-Wheel-Drive System that sends full power to both axles. While Toyota kept the RAV4 Hybrid's actual output under wraps until it shipped the vehicles to the dealers, we now know it to be a whopping 194 horsepower. As mentioned, this marks the first time a hybrid version is more powerful than the standard model. Let's go places! No one is more excited about the latest and boldest addition to Toyota's hybrid lineup than we are. Charlottetown Toyota has a great selection of new RAV4 Hybrids, poised in our showroom and ready for some serious test-driving. Stop by 1 Superior Crescent Charlottetown, PO BOX 730 in Charlottetown, PE, to see the brand RAV4 Hybrid before anyone else. We serve a wide area including Charlottetown, Stratford, Mt. Herbert, Cornwall, Marshfield, Brackley, and Milton Station, so do not hesitate to schedule a test drive at your convenience.